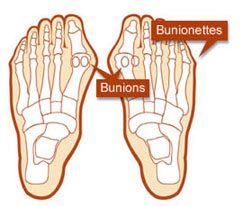 Bunions and bunionettes are both common–and commonly misunderstood. Since this painful foot deformity typically develops slowly over the course of months or years, many people don’t seek treatment until long after symptoms appear. Bunions can cause either intermittent or chronic pain. Because most people spend a great deal of time on their feet, it can be difficult to properly rest the bunion, allowing it to heal. The bone deformity or the enlargement of the big toe joint will be permanent, unless corrected with bunion surgery. However, the swelling of the bursal sac and the soft tissues surrounding the bunion can be reduced greatly with proper rest and care. Bunions can develop for many different reason, including genetics, congenital deformities, and injury to the foot or toes. Bunions are also closely linked with rheumatoid arthritis. While some experts believe that tight or improperly fitting footwear can cause bunions, the evidence is inconclusive. However, there’s no question that unsupportive or tight footwear can irritate and exacerbate a bunion, causing the bursa and tissue to become increasingly swollen and irritated. Are Bunions Related to Heel Pain? Bunions can, in some cases, indirectly cause heel pain. As the bunion grows larger and more painful, you are likely to unconsciously make changes in the way you walk to minimize the main from the bunion rubbing against your shoes. These gait changes can place additional strain on your arch, inflaming your plantar fascia. If bunions cause you pain while walking, it’s a good idea to use orthotic inserts to ensure that your foot is supported and properly aligned while walking, to avoid developing plantar fasciitis. It’s also possible to develop a hard bump on your heel, what some people refer to as “heel bunions.” However, while a bump on the heel has a similar cause to that of a bunion, irritation of the soft tissue and bursa near the back of the heel, this condition is known as Haglund’s deformity. Avoid high heels (they push the big toe outward and can inflame the joint of a bunion) tight shoes, or other ill-fitting footwear. Choose shoes that have a wider toe opening, including sandals, to relieve the rubbing and irritation that comes along with more confining shoes. Take anti-inflammatory medications (aspirin, ibuprofen, etc.) to ease inflammation and target pain. If the bunion becomes inflamed and irritated, applying an ice pack can reduce swelling and pain. If the inflammation because severe, you may need to see a doctor. Cortisone can be injected at the site of the bunion to reduce the swelling at the joint of the big toe. If your bunion causes you persistent pain and the condition becomes worse over time, you should consider surgery with your doctor. Surgery on a bunion can correct the bone deformity, increase function, and relieve pain. While surgery is often successful, the decision to undergo bunion surgery should not be considered lightly, since there there is a significant rate of surgical failure. It’s also important to understand that the big toe can move back into its previous place if the patient does not follow post-operative instructions, which will result in the pain of the bunion returning. The surgical failure for bunions can be reduced greatly if activity restrictions are followed and proper footwear is worn after surgery. This article was originally published on August 19, 2015 and updated on January 18, 2018.